Qualcomm is always working on new opportunities for Augmented Reality. One of their latest kind of blew my mind. This new technology solution not only enables developers to create some new app in minutes, it also really connects the offline and the online reality. Now, Qualcomm comes up with an Augmented Reality app for kids which is illustrated with the Sesame Street character Erni and Bert which Netbook News just published. Both characters come alive immediately when putting them on a specially designed board, or when you put a television screen on the board. Just imagine what opportunities this offers in terms education and knowledge you can integrate in this technology. Smashing! Augmented reality (AR) has a glorious future according to a new market research published by MarketsandMarkets. It will be interesting to see which role QR codes play in that future as more and more technologies arise. The new market research report “Global Augmented Reality (AR) Market Forecast by Product (HMD, HUD, Tablet PC, Smartphone) for Gaming, Automotive, Medical, Advertisement, Defense, E-Learning & GPS Applications (2011-2016)” states that the total Augmented Reality applications market will be growing by over 95% from 2011 to 2016. The research sees it reaching a market volume of $5151,74 million. According to Comscore research almost 10% of all smartphone users have scanned QR codes in June this year. 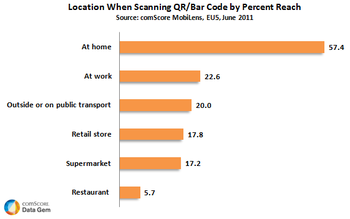 The interesting fact is that most users scan their QR codes from home (57,4%). In public only 20% use those QR scan options from outdoor advertising or in public transport. But what kind of Augmented Reality technologies are rocking the transformation from the physical to the virtual world, or shall we say to the mobile world? Some months ago, we only had browser technology like Layar and Wikitude. Today, companies like Tesco are experimenting with other capabilities in their retail shops. For a long time, we had to use QR codes or trigger points to initiate some activity with AR technology. The Aurasma technology -unlike the GPS based technologies Layar (until the Vision version) and Wikitude that merely recognizes what someone has tagged as locations or places- is a new generation augmented reality browser. Aurasma recognises images through cameras in a way search engines recognise words. The browser then creates so-called 2D or 3D „Auras“ which show animated audio-video content. Just watch some examples of Aurasma campaigns. With blippAR the whole advertisment becomes the response tool. It is enough to simply point in the direction of the ad with the app. Still, the awareness challenge needs to be solved. And, the need for a specific browser to use the technology. See some examples of blippAR usage. At the moment you can even participate in the interactive blippAR campaign “escape the map” by Mercedes Benz. Printechnologics is based on Touchcode carrier technology. It contains a blind or transparent code which is embedded via invisible data storage development inside print products like carton, foil or simply paper. Printechnologics turns the AR identification around as you lay the paper on top of the tablet or smartphone, and not the other way round. And you don’t even need to modify your device, download a browser, use NFC (near field communication), or a camera for it to identify and initiate the online activity form the offline trigger. The last issue from the ICONIST carried a Printechnologics card and here you can see how it connect the two worlds….